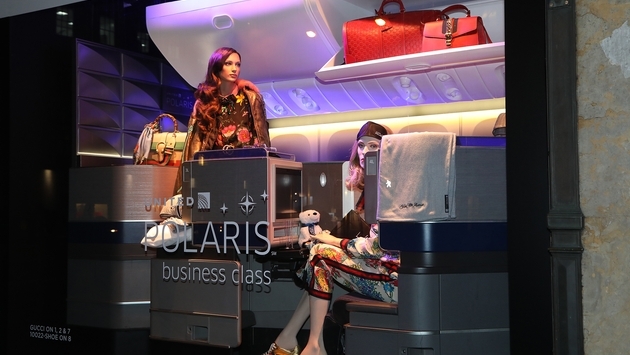 United Airlines’ new Polaris Class is featured in a Saks Fifth Ave. window display. (Courtesy Edelman Public Relations via Saks Fifth Ave.
Quick, think of the most well-known department stores in the world. Even if you’re not a seasoned, savvy shopper, you at least know of Macy’s, Bloomingdales, Nieman Marcus, Harrod’s in London, Corso Como in Milan, Galeries Lafayette in Paris—and Saks Fifth Avenue. Each of them feature an iconic window display that becomes a point of pride for the retailer being spotlighted, which is how United Airlines must feel today. United and Saks Fifth Avenue unveiled a United Polaris-themed takeover of the windows in the luxury retailer’s flagship store on Fifth Avenue in New York City on Wednesday to highlight the carrier’s new business class (and before you ask, yes, airlines are most definitely retailers). Entitled “Now Arriving,” the 14 storefront windows display a replica of a United Airlines plane—including actual United Polaris seats—which will debut on flights in February, as well as the business class cabin’s custom Saks Fifth Avenue bedding suite. The new bedding collection features plush duvets, lightweight day-blankets and a large and small pillow for each United Polaris customer. United Polaris business class, the airline's most significant product transformation in more than a decade, features a reimagined, sleep-enhancing experience for intercontinental travelers. Why? Well, what’s the one thing you’d want to do on a nine-hour flight? In rethinking the international business class experience, United conducted more than 12,000 hours of research, and, not surprisingly, sleep emerged as the single most important priority for international business class travelers. So, in a first-of-its-kind relationship, United worked with Saks Fifth Avenue for custom bedding for both United Polaris lounges and onboard the aircraft. “High-quality pillows and bedding are crucial to a good night’s sleep, which is why we turned to luxury department-store, Saks Fifth Avenue. 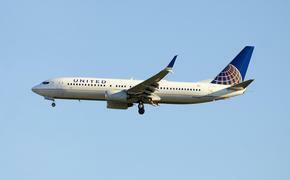 Through our relationship with Saks, our passengers now have access to luxury, custom linens, pillows and blankets to help them relax and get the rest they need,” said Mark Krolick, Vice President, Marketing at United. The United Polaris themed windows will be on display until January 22, 2017. United will begin rolling out the United Polaris seat on its 777-300 ER fleet this quarter and subsequently on Boeing 787-10 and Airbus A350-1000 aircraft, as well as on Boeing 767-300 and 777-200 retrofits. The first of nine United Polaris lounges is now open at Chicago O’Hare International Airport, with the remaining opening this year and next.